Here’s a nice way to spend half an hour. 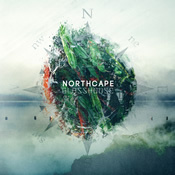 Smooth, melodic electronica from Northcape. No surprises or reinventing the wheel here, just a fresh round of laid-back environments and catchy melodies. Glossy around the edges, like we’re viewing the world through a soft focus and taking our sweet time about it. Alastair Brown’s go-to sound is soft and round, anchored with a solid low end. The beats here are less hectic than on a lot of its kin, which I like–too often in this genre the staccato assault of the glitchwork is front and center. Here it functions as a quiet rhythm section whose job is to just augment the soft tones. There’s a fair degree of sameness here, perhaps highlighted by the short running time, but when I’m in the middle of this and it’s working its bit of chillout magic, I mind less. This is one of those releases I’ll melt into a wind-down playlist and enjoy it that way. Brown closes out the EP in a more ambient style with “Green Waves,” letting warm pads stretch and just barely touching them with a tick-tock beat played out in quiet chimes. It’s got a pleasant lullaby-like quality to it that ends your time in this Glasshouse quite nicely. A good addition to your melodic electronica stash. Available from Sun Sea Sky.